Total War: Attila depicts the sunset of the once mighty Roman Empire, struggling to defend its territories, besieged on all sides and now divided into Eastern and Western factions. Enter the Huns; nomadic hordes pressing in from all directions. This is the stage, and what a wonderfully grim and spectacular one it is. Though many are left with a sour taste after 2012’s technical fiasco that was Rome II, you may be pleased to know that this year’s instalment is anything but. Developers Creative Assembly have proven that they can indeed listen, and have released a much better game because of it. It’s not to say that Total War: Attila doesn’t come with its share of issues, but definitely nothing as ugly. 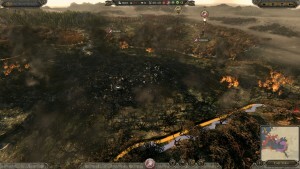 Basic gameplay in Total War: Attila is mostly similar to the predecessors, split between real-time tactical battles and a turn-based strategic map. Whilst the 4x portions of the strategic map are nice, the tactical RTS battles are still where Total War strikes its strongest mark. Though at the bottom line it’s still the well-worn rock-paper-scissors setup that features in most strategy games, it’s all tied to your relative performance on the strategic map, thus most battles are generally skewed towards the side that’s better set up for the situation. However this doesn’t mean assured victory, and a skilled general can most certainly turn the tide of war against an unsuspecting foe. There’s a huge amount of strategic depth on show here; from the stances and abilities of each unit, to the large variety of formation set-ups available. It’s the franchise trademark at its best, with Total War: Attila fully up to par. It’s not without its faults, as some niggles do show up now and then. Naval battles are present, though their presentation features none of the polish and style found on land. Ships tangle around each other in a striking disaster, cluttered and wonky. Some of the issues that plagued Rome II are also still here; unit AI behaving erratically, refusing to accept commands, and simply being a nuisance in general. This aside, there are other issues I often wonder whether to just accept as a Creative Assembly design choice and just be done with it. The interface is, as usual, unimaginably unintuitive and more complicated than any software you’ve ever used, leaving much to be desired. The AI is ponderous and stutters, turns take too long to complete, loading screens are too lengthy, and the list goes on. They’re issues that are inherent to the Total War franchise, so fans will be familiar, but they are issues nonetheless. With the setting following so close on the heels of 2013’s Total War: Rome II, one might even feel this latest installment is somewhat of an expansion; a ‘Rome 2.5′ if you will. 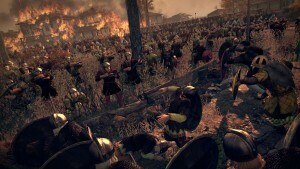 Despite appearing as such, Total War: Attila sets itself apart mostly in its faction diversity. Traditional set-ups are present, but the spotlight is on the hordes and their gameplay. In stark contrast to the building nature of previous titles, Attila tends to favour the destruction. Though you may play as the Romans with their cities and well equipped armies, it’s the barbaric factions and their hordes; roaming and fighting, constantly at war with an inability to ever settle, that truly shine. They feel as the embodiment of Total War, thus playing as a horde is undoubtedly the best way to experience the game. No building a glorious eternal empire here; instead Creative Assembly wants you to burn it all down as you invade the land to pillage and prosper. Essentially, a horde is both a settlement and an army, coming with all the perks and subsequent negatives. You’ll always be moving, recruiting units as you pass by. Your holdings will never be caught unguarded, nor will you be pushed to defend a single position. At any time, you’ll be able to settle temporarily and upgrade your tents and battle units. However, as a horde is a single contained force, even a single loss in a significant battle can be a huge setback, if not a total loss. It’s all your eggs in a single basket, though a strong basket it is. This roaming gameplay makes for a wonderful change of pacing, far quicker and dynamic as opposed to the more plodding nature of building an expansive kingdom and its subsequent armies. There’s a lot of notable interaction when playing with the hordes in Attila. They don’t like each other by principle, thus being in close proximity will most definitely trigger a rivalry. This isn’t so much a problem as you’re off roaming the territory as a nomadic powerhouse, but when gathered together to defeat an insurmountable opposing force or to sack a particularly well defended city, more intricate strategy must be applied. Sub-hordes may also break away if your settlements are completely run over, leading to the creation of an entirely new hostile force. It’s interesting interplay, and deep strategy is present in this gameplay. 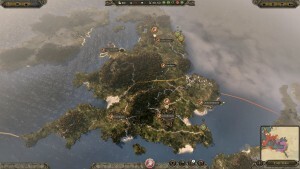 Total War: Attila also expands on its political side of gameplay, allowing for a huge intricate network of relationships to form as you navigate your way around noble families. You’ll be set-up as a specific family to which you’ll improve by glad-handing nobles, arranging marriages, and securing the loyalty of the noble elite whilst assassinating threats and defeating rivals on the battlefield. Powerful families with strong presence will have the power to demand taxes, and field loyal and superior armies despite seeing reduced civil growth as a consequence. On the other hand less influential rulers will see the reverse. The dynamic system is both in-depth and meaningful, and often surprisingly personal. On the technical side, Creative Assembly’s efforts are far less pronounced. On a positive note, Total War: Attila is a beautiful game, featuring gorgeous vistas and a realistic grunginess to its presentation. The environment reacts to the war being waged across it, creating a most spectacular world map. It’s sad then, to report that Attila performs just as well as your last decrepit computer ready for the scrapheap. Stutters, framerate drops, and laggy interface elements with notable texture inconsistencies are only some of the issues I encountered. Thankfully, this review copy’s online-only in-game encyclopaedia is much better implemented in the published game, as I wouldn’t want most to experience the often minutes long load times and common crashes that I saw whilst using it. Most damning of all, the game sometimes doesn’t even want to start properly. All this, with medium high settings on a set-up that can be considered well into the high-end spectrum of gaming computers is troubling indeed. Some may be teething problems with a newly released title, but most point to a definite flaw in the engine instead, an issue that will need to be addressed soon. Thematically, atmospherically, and historically, Total War: Attila is a resounding success. Technically though, the game falls short on all sides. Granted Creative Assembly did fix many of the issues that plagued Attila’s predecessor, it’s still a rather optimised title, and definitely doesn’t feel ready for launch. A wonderful take on an underused time period with well thought out improvements on existing gameplay formulas make Total War: Attila a definite for fans of the Total War series. A pity such a promising title has to be laden down with frustrating yet long running issues of the franchise. Bottom line; it’s what Total War: Rome II should have been and more. Newcomers to the franchise, it won’t be friendly so tread with care, but you might just discover one of the most intrinsic and well-designed strategy experiences to date. Total War: Attila was developed by The Creative Assembly and published by SEGA for the PC. It is currently available worldwide.